Phase I of registration is now OPEN. This phase is reserved for those working in an AZA zoo, participating in the SSP or those working directly with orangutans in human care early access to the workshop. Please Register Here. Phase II will begin May 26th, 2019 and is open to all other interested parties. Matthew Nowak is a biological anthropologist and a conservation biologist who has been studying wild ape populations in Southeast Asia for over ten years, and has worked with both large and small ape species in the region. Matt has several years experience studying wild gibbons, siamangs and orangutans, and forest productivity in the rugged terrain of the Batang Toru forests in North Sumatra. He is currently employed by the Swiss-based NGO, PanEco Foundation, which along with its local Indonesian partner Yaysan Ekosistem Lestari (YEL), work together to implement the Sumatran Orangutan Conservation Programme (SOCP). His current focus within the SOCP is to help monitor and protect the last remaining populations of Sumatran and Tapanuli orangutans in the world. He is responsible for supervising research on wild orangutans at three field research stations, large scale orangutan surveys and general biodiversity research in the region. ﻿AZA's policy statement on the use of apes in commercial entertainment. The Association of Zoos and Aquariums (AZA) recognizes that personal possession of non-human primates has significant negative implications for animal welfare and health as well as public health and safety; therefore, in accordance with AZA’s Board-approved Policy on the Presentation of Animals, AZA does not support personal possession of non-human primates and encourages AZA member organizations not to participate in animal acquisition and transfer activities that may facilitate the personal possession of non-human primates(5). Orangutans should never be pets, for many of the same reasons that they should not be exploited in the entertainment industry. Just as with apes bred for performance, those produced by breeders for the exotic pet industry remove them from their mothers as tiny infants, often within days of birth. The argument is that by doing so, the infant will “bond” with the human owner. Such pet owners typically dress the apes in human clothing, keep them in their homes, and treat them like human babies. But just as with performing apes, these baby-substitutes inevitably grow too large, strong, and willful to safely handle. At this point, the owners must cage their “pet” – a confusing and frustrating new reality for the young ape. 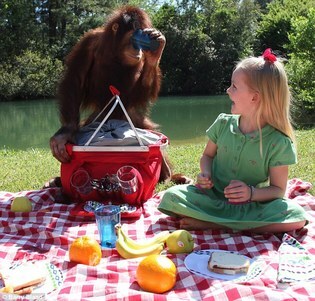 Even if the pet-owner is able to construct an ape-proof caging system in his home or backyard, the situation will remain unsatisfying and inhumane for both parties – the orangutan, accustomed to a life as a treasured family pet, remains consigned to life in a cage (typically much smaller and less complex than the enclosures zoos and sanctuaries construct for apes), and the family faces the daily guilt and disappointment of managing their former cute and cuddly infant into adulthood. And since orangutans can live more than 50 years in captivity, there is the additional concern of caring for the ape beyond the lifetime of the original owners. Together with the Association of Zoos and Aquariums, the Orangutan SSP serves the accredited zoos that house orangutans in the United States, Canada and Mexico. Working closely with respected professionals in the field, the SSP provides help and guidance to zoos housing orangutans. Together, zoos and the SSP seek to provide the best possible environment for these amazing apes. Orangutans live in 52 accredited zoos all across the United States, Canada and Mexico. Find out where they are and more about their exhibits here. Now you can wear your support for the Orangutan SSP! Visit our Cafe Press site to get clothing, drinkware, stickers, and more featuring the Orangutan SSP logo! This website serves as a central forum for important information for members of the SSP. Click here to enter the Member’s section and find out the latest happenings for and about the Orangutan Species Survival Plan.